On to Stavelot, then. Before reading the book, I was all for smashing the whole 3rd Bn., 2 SS PzRegt. (highlighted in the screenshot above) against the bridge at Stavelot. During the real battle, Peiper chose a force with more punch. During the night of 17/18 December Peiper reorganized his kampfgruppe. Obersturmfuhrer Kremser's 1 Company and Obersturmfuhrer Christ's 2 Company of Pz.Rgt.1, both equipped with Panthers, together with Haupsturmfuhrer Preuss's 10 Company from Pz. Regt. 2, would form the lead element. For the assault of the bridge they would be supported by the pioneers of 9 Company, Pz.Regt. 1, who were tasked with taking the approach to the bridge. The remaining two companies of Pz.Rgt. 1, 6 and 7, both equipped with Mk IVs, would advance on another axis south of the Ambleve with the objective of securing the crossings at Trois Ponts. So I did within the game. 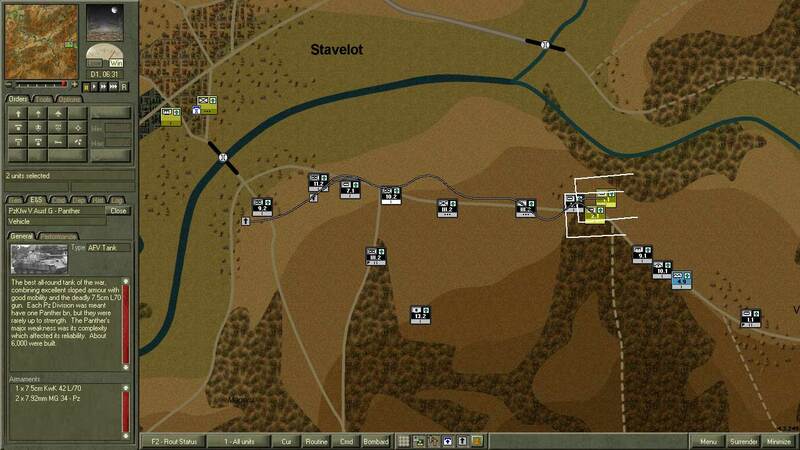 The order of battle of the game scenario was spot on and I was able to find all the before mentioned formations. However, the units that I needed for the advance guard parties mentioned above were a bit spread. 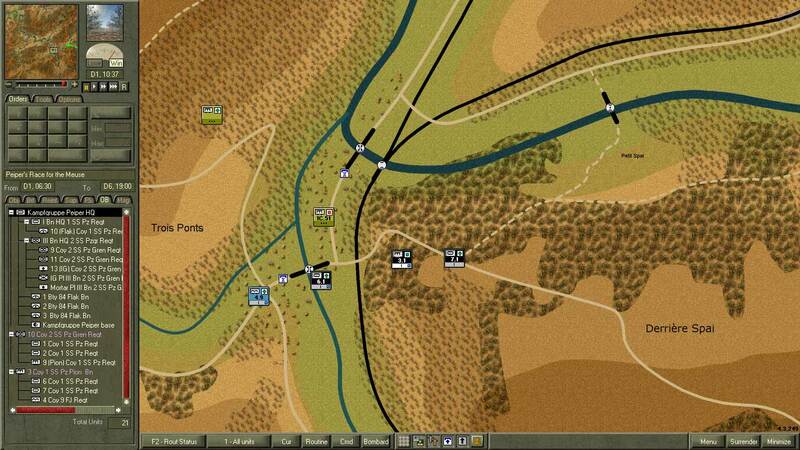 For example, the two Panther tank companies were some way back into the convoy (see screenshot below). Remember to righ click the image and open into a new tab (yes, thank Google for the inconvenience). 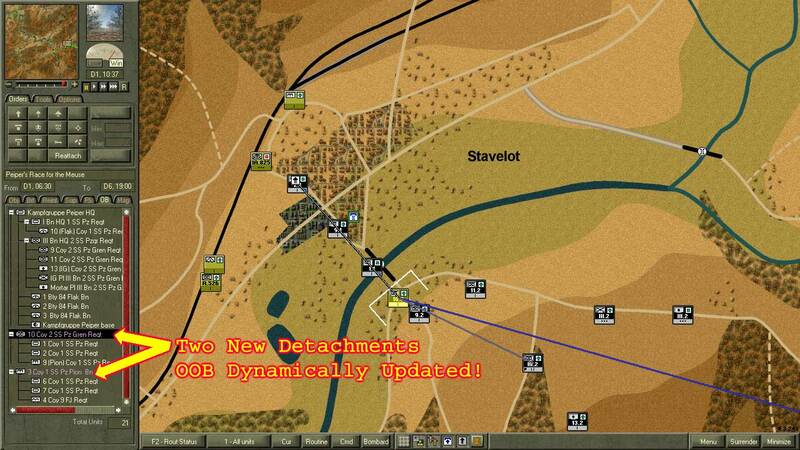 The two Panther tanks companies are selected, with their info shown in the tab on the left. 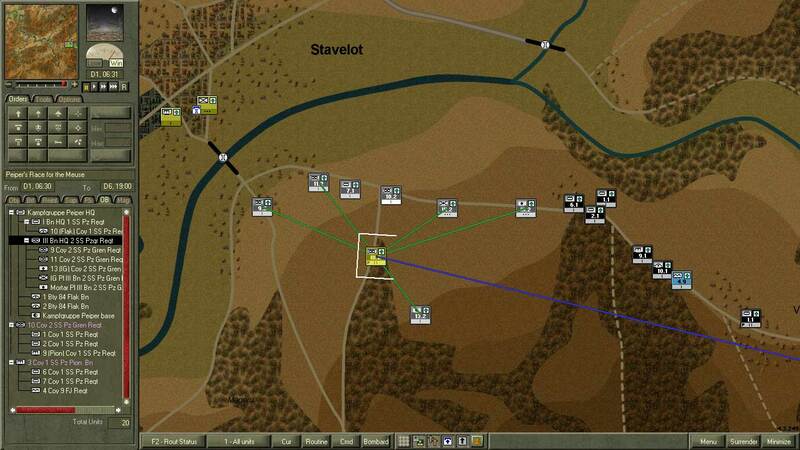 The Stavelot was crossed at around 0815 and the crossing was secured at around 10:00 AM (game time). The Panthers proved to be a true ramrod and the job was done with no fuss but with a slight delay to secure the crossing. The screenshot below shows the situation at 10:34 AM. 1034, Stavelot. The advance guard party just shoved the American forces with ease. An additional comment on the game engine. 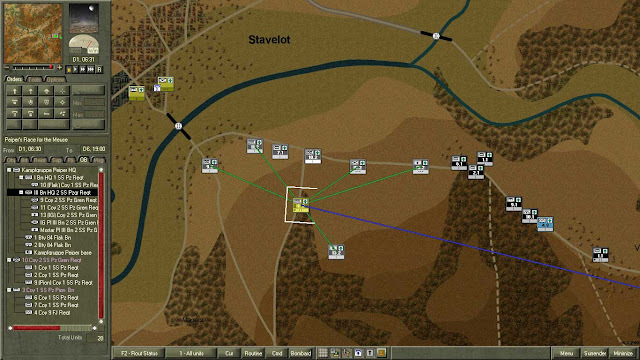 I basically created two new formations (the advance guard to secure Stavelot and the advance guard to approach Trois Ponts through the less preferred shouthern approach) by selecting units from their original formations (hold the Ctrl key) and giving them an order to attack. The cool thing is that the engine created two new formations accounting for this command decision. That's what I mean by "OOB dynamically updated" in the screenshot above. So far, so good. The book taught me that trail blazing is better done with a lot of shock power. And not to be shy to mix and match assets (i.e. it's OK to have a kampfgruppe within a kampfgruppe!). 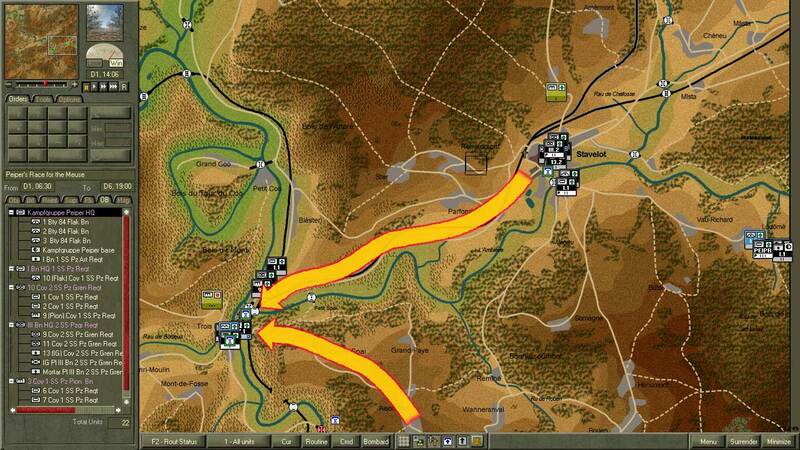 Now let's go to that not-so-hot approach to Trois Ponts, south of all this action at Stavelot. The nimble advance guard (two companies of Mk IV tanks, one Fallschirmjagger and an engineer company approached the crossing and took it out of the American's hands. Just like that. 1037, Trois Ponts. The southern crossing at Trois Points is not secure yet, but the opposition is hopeless. C Company of the 51st ECB (US Army) had set up a roadblock covering the road from Wanne on the heights of the Salm River. They engaged the leading MkIVs with bazookas, but were unsuccessful, and the engineers quickly withdrew back across the river. At 13:00 hrs Colonel Anderson (US Army), commander of the 1111th Engineer Group, ordered Lieutenant 'Bucky' Walters, 51st ECB, to blow the Salm bridge. The MK IVs were descending the road from the heights when they saw the bridge explode into the air. They would not pass through Trois Ponts that day, or any other. Furthermore, in the game scenario the advance guard that just shoved away the forces at Stavelot, continued almost unopposed towards Trois Ponts. None of the real life high adrenaline fights and the blowing of the bridge north of Trois Ponts happened in this scenario. At around 1400, the situation was as shown in the screenshot below. The two advance guard parties converged at Trois Ponts, with all the bridges intact. But hey, here I am sitting at Trois Ponts, with the bridges in good shape! Peiper would have been thrilled, I suppose. Nice! I know nothing about this particular scenario, but this reality-vs-game comparison is brilliant! As for AI variability, when I played this scenario (not as historically accurate as your play through) the Trois Points bridge was blown just as my 2nd group approached. Well done though. I'm looking forward to the rest of the installments!